COLUMBIA, Md. 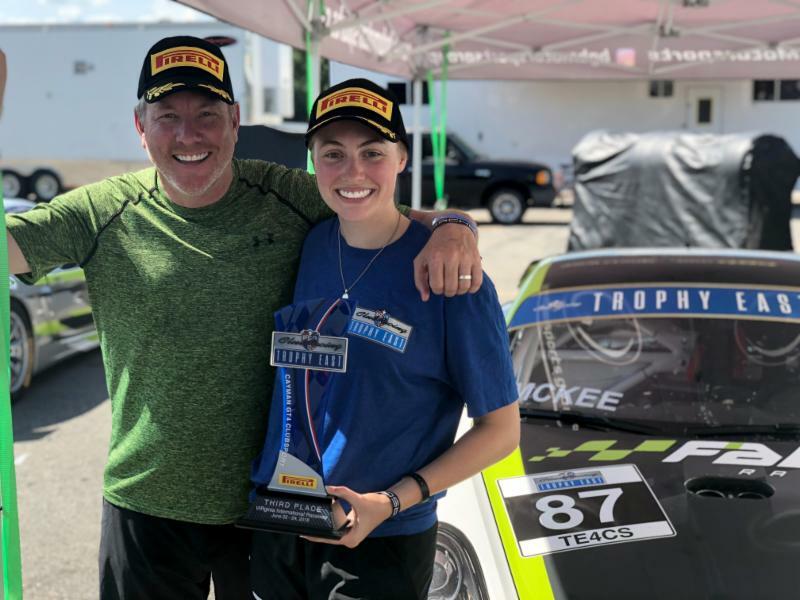 (Aug. 20, 2018) – Throughout a PCA Club Racing weekend, you may see a few father/son teams, but one team in the paddock – a successful father/daughter duo – certainly sticks out. PCA Club Racing Trophy East Series competitors Sydney and Bruce McKee are taking the semi-professional series by storm this year, individually sitting in fifth and sixth place in the TE4CS class putting their car second in overall points. The BGB Motorsports teammates share the No. 87 Cayman GT4 Clubsport MR entry, affectionately known as “Bart.” Most event weekends, Sydney races in Sprint 1, while Bruce races in Sprint 2 – the two then share the car during the 80-minute enduro races. Although Sydney is entering her sophomore year at Brown University, (double majoring in Engineering and Economics), and no longer lives at home, she says her bond with her dad is closer than ever. Sydney’s mom, Wendy, is also a driving force between the dynamic duo. She’s often seen taking photos, timing pit stops, and of course, supporting the team in general. The young driver says her mom has become an integral part of their race weekends. Sydney also says it doesn’t faze her one bit to be the sole female (and youngest) competitor in the Trophy East series. The 20-year-old said she feels incredibly supported by PCA and the Trophy East staff, as well as by everyone on the BGB team, her coach, and of course, her dad. Although 2017 marked Bruce’s first year of racing, this year, his confidence of where and when to make a move on track is truly shining through. Bruce also credits the pair’s coach, Robby Foley, as a huge asset to the McKees, both as a driver coach and as a friend. Foley works closely with the team to set up the car properly and helps to build a race strategy for the entire weekend. A favorite shared memory between father and daughter is their first full race weekend as co-drivers at Road Atlanta. During that weekend, FaDa Racing was born. Road Atlanta also gave Sydney her first opportunity to rib her dad about where on track she was faster than he was, while he had his first taste of swallowing and gaining pride at the same time, Bruce joked. “We had reasonable success that first weekend, and we walked away from the weekend with the car being in third-place in points and we were both incredibly excited for the rest of the upcoming season,” Bruce said. Daytona Beach, Florida-based BGB Motorsports has been supporting Bruce and Sydney since Bruce first started competing in 2017.The duo credits the team for much of their success and most of their enjoyment of the sport. The McKees also say they have a lot of fun in the paddock with the BGB team (along with other drivers and teams), plus enjoying the fantastic food that Justin cooks at the BGB trailer during every event weekend. Sydney and Bruce agree that the PCA Trophy East Series has been the perfect entrance for the two to enter racing together. Next up for the father/daughter duo is a race weekend at Road America over Labor Day weekend. The pair is aiming to gain more podium finishes and working hard to keep “Bart” in second place in the TE4CS class standings.